WORDS little-used in my world: ‘Fusion’. ‘Funky’. ‘Booty’. ‘Jelly’. 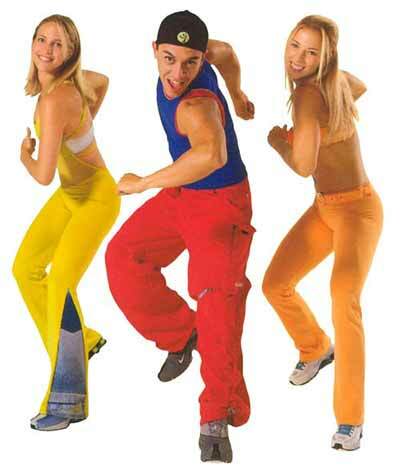 And yet, and yet… tonight, at zumba class, we’ll be using them all liberally. Zumba crept up behind us all and goosed us like a pervert last year. Originating in Colombia in the 1990s, it’s inspired cult-like fervour, blending reggaeton and variations of Latin dancing in an inanely upbeat, strangely brainwashy, supposedly sexual manner. For many, it’s clearly a great opportunity to breakout ’80s gym wear. “We’re never gonna see these people again,” I reassure Ben and Natalie en route to Zumba World, before Natalie cunningly rolls her ankle and hobbles off. The instructor wriggles around like an electric eel, but I can’t get the hang of this wobbling malarkey. Ben and I find ourselves ill equipped to shake what our mamas gave us – we’re more like ironing boards set to vibrate. In the jumpy numbers I feel like a grinning skull on a pogo stick. The routines are fast, and range from unco children’s party flailing to x-rated hokey-cokey – I’m pretty sure our instructor’s making them up as she goes along. In fact, a future adventure might be to wear some undies over my tights, infiltrate a zumba class and lead it. To glory! Keeper? Sure, next time the infomercial comes to my lounge-room.